John Naka wasn't psychic, but he often had a vision for the future of a bonsai, and he had the artistic skills to sketch his ideas on paper. These sketches inspired and guided his students and workshop attendees as their trees developed. When it came to his own collection, John rarely made sketches. The vision in his head could be applied directly to his tree. But in 2000, when John sketched a tree for the annual Nanpukai show brochure, the subject he chose was his twin-trunk pomegranate. John was especially fond of pomegranates; he had several in his collection and he enjoyed watching them flower and fruit. 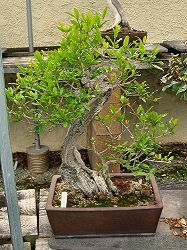 The brochure was printed and the sketch was filed away – until 2006, when California Bonsai Society was designing its annual show brochure. Once again, John's own tree was featured on the cover. The pomegranate has a wonderful curving main trunk with considerable shari (dead wood). All branches on the main trunk are near the apex. 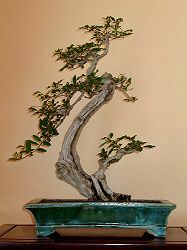 The smaller, secondary trunk is embraced by the curve of the main tree. For many years, this tree has lived in a beautiful antique Chinese pot: deep, with straight sides and a fabulous unglazed brown patina. For this sketch, John lengthened the left branch on the main tree. 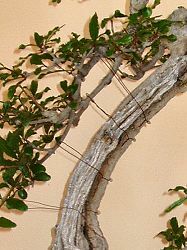 The branch follows the line of the trunk and brings foliage, flower, and fruit to a previous void. John also changed the pot: the curved sides of the pot in the sketch mimic the curve in the trunk, and the shallow depth relates better to the delicate feel of the tree. 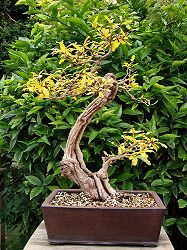 Lengthening one branch and changing the pot would have made a dramatic difference, but John never made the changes to his pomegranate that he sketched. In his final years, he indulged his passion for painting. He was an artist at heart, and ever creative. Fortunately, the sketch made his wishes for the pomegranate known. The first task was to evict the family of termites that was feasting on the dead wood of the main trunk. John's favored method was to dunk the entire tree in a malathion bath. It still works quite well. Next, numerous crossing or leggy branches were removed. After repotting and replacing all the soil, the tree was allowed to recover for one year. Only then was the tree trimmed to attain the silhouette of the sketch and the left branch allowed to grow in length. That branch needed to be lowered into proximity with the trunk. Pomegranate doesn't like to be wired, so guy wires were gently anchored around the branch and trunk. Plastic tubing protected the bark from the wire. Flowers were removed so all energy would go into branch growth. Lastly, a smaller, more shapely, glazed pot was chosen, in a color that would complement the flower and fruit. For the first time, John's pomegranate is beginning to resemble the sketch he made so many years ago. Though John is no longer with us, his vision has finally been realized.